System Specs - Tradesmen's Software, Inc.
Tradesmen’s OS3DE will run efficiently on most Windows PC’s and Parallels/Windows on Intel Macs. The software requires an NVIDIA video card for optimum performance. ATI and Intel cards are known to produce undesired results with the type of graphics utilized within our software. Remember these are minimum recommendations. For best results, work on a computer that exceeds them by as much as possible. If your machine is over 3 years old, consider replacing it completely rather than upgrading it. Mixing years of technology and hardware may produce undesired results. Most of our customers use multiple monitors or LCD televisions. 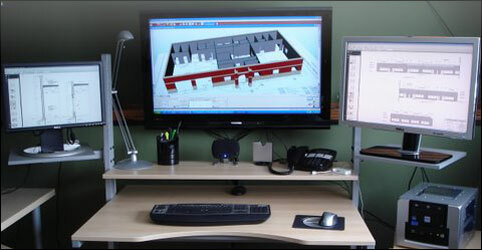 One monitor is used to operate the software while one or more additional monitors show the cross sections, elevations and details of the blueprint (see an example below). If you are purchasing a new machine, consider running multiple monitors. Three monitor setup featuring 40″, 27″ and 20″ monitors.